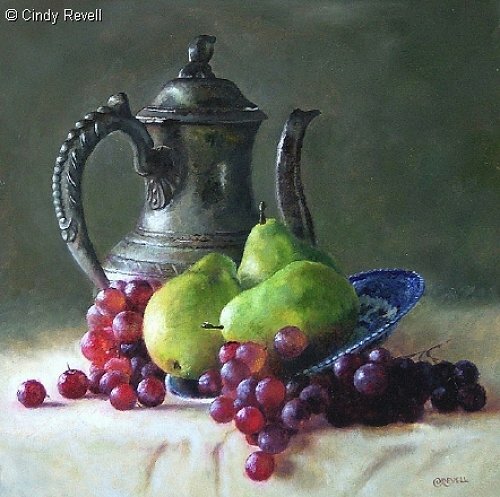 There is a purely entertaining side to browsing Cindy Revell’s website still life gallery. With each page I discovered new subjects, new variations; different angles and additional unexpected objects would alter and turn over the hierarchy inside the depicted realm. 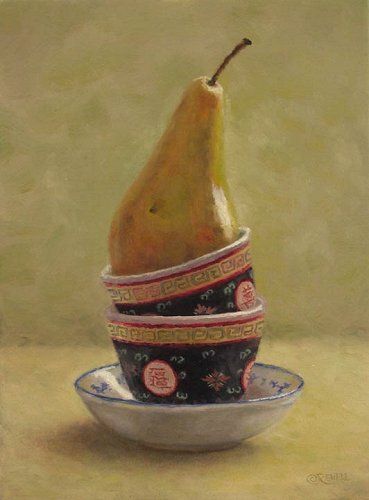 For example, a fruit that crowned a tower of several cups in one painting may lie deposed next to a jug or a pitcher in another. In other words, there is a continuous evolution of theme — or at least it is possible to see the exhibited body of work that way. Because we are permitted to witness these changes and complications, because they are visible and clearly so, the complexity of some of the more intricate compositions appears natural — and particularly rewarding. The artist consistently (even religiously) remains within the genre: most changes are limited to composition and because of that are easier to follow. Stable framework allows for the radical shifts within it; stability and change interlock and form a style rich with controlled modification — a mature and confident expressive instrument. But imagine a different scenario: suppose the artist wanted to experiment with some generic qualities — geometrical form and lighting, for instance. The fruits slowly lose their recognizable shape, approaching a more cubist representation; light loses meaning, the compositions become flat… I don’t think that would work (probably a complete stylistic make over is needed). In a way, this counter example emphasizes how solid and reliable that framework is. Light may fall from either direction, and elucidate areas usually ignored by the human eye. This feature is quite elusive (OK, I’m speaking for myself), but when discovered gives a sense of relief — I have to wonder if eliciting such a response was a part of the plan. It appears that the artist enjoys shaping her subjects by adding white and by manipulating value. Both color and light display properties reminiscent of Flemish still life painting, a tradition the artist mentions as one of her influences. The air indeed appears to mix the soft and broad Northern sunlight with cool, light breeze, added to this is that quaint sanctity of interior — or to resurrect that mix. I think that the artist has developed a focused vision: she strives to minimize frictions (and loss of mental energy resulting from it) occurring between the audience and the art piece, created by the painter’s persona. In other words, she aims to downplay her interference as the creator, in a way trying to showcase the art as independent, objective “thing” that appears from nowhere and should be judged simply for what it is. I find this idealistic approach (or my own understanding of it as such) appealing. I would claim that the artist positions herself as a skilled and sensitive visual communicator. She redefines the process of presenting and viewing art — discreetly and without unnecessary grandeur. I love your work. Its absolutly fantastic. 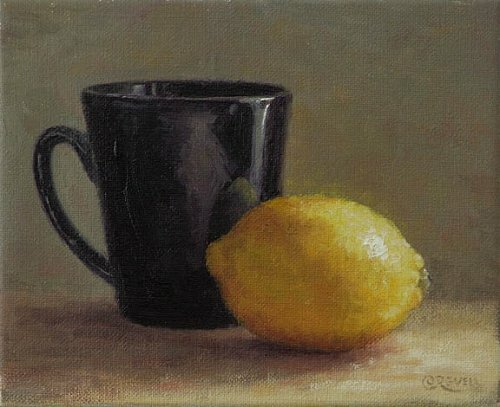 I enjoy painting still life and am working on raising my skill level. But your work amazes me and I love it. You can tell the amount of passion you have in your work and that you really enjoy what you do. You inspire me to pursue my art career.